An applied-B ion diode is an anode-cathode gap with an applied pulsed voltage (resulting in the electric field F) that accelerates ions from the anode, creating an ion beam. The applied voltage also accelerates electrons from the cathode, requiring the application of a magnetic (B) field to trap the electrons and prevent them from crossing the gap and shorting out the diode. Applied-B ion diodes are used for generation and focusing of intense light-ion beams. Our laboratory pioneered several researches that have had significant impact on understanding the physics of ion diodes as well as contributed to atomic physics under strong fields. Maron (then at the Cornell University) et al. made the first Stark shift E-field measurements in an ion diode . In these experiments, a thin aluminum coating was added to the anode, which formed doubly ionized aluminum that is accelerated across the gap. To measure the time-dependent E-field distribution, the Stark shift of the Al III 4d-4p transition at 4529 Å was observed using a spectrograph with both temporal and spatial resolution. An example of the measured line profile at a particular place and time in the diode gap is shown in Fig. 2a where the unshifted component is determined to be scattered light originating from the anode plasma and the shifted component at longer wavelength corresponds to an electric field of 1.2-1.5 MV/cm. Figure 2b shows the measured E-field distribution in the diode gap at one time, which peaks at ~0.8 MV/cm near the anode and decreases to ~0.4 MV/cm near the cathode. Time-dependent measurements of Zeeman splitting of the 5d-6p transition of singly ionized barium centered at 6142 Å (Fig. 3a) were employed  to investigate the B-field dynamics in an applied-B ion diode. 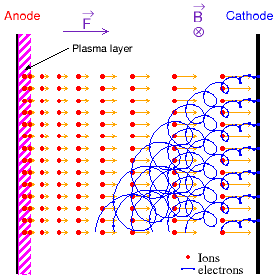 In that study, barium was introduced as a dopant on the anode side of the diode where the Ba II ionization state remains localized in the anode plasma near the original anode surface, creating plasma conditions sufficient for the observed line shape to be dominated by Zeeman splitting. Figure 3b shows the time-dependent B-field within a few microns of the original anode surface. The field is observed to increase over the applied 7.6 kG. This increase is caused by ExB drifting electrons, which create a diamagnetic field that decreases the field strength near the cathode, requiring an increase in the field on the anode side in order to conserve magnetic flux. 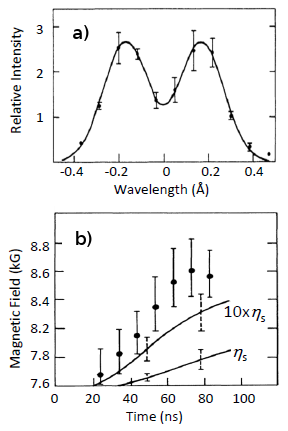 Magnetic diffusion is expected to dominate the field penetration for this geometry at these conditions, but a classical Spitzer resistivity predicts a much slower diffusion speed than was measured. This anomalous resistivity was later explained as being caused by instabilities in the anode plasma that increase the collision frequency and therefore also the resistivity . These measurements are an example of how real world effects such as instabilities can significantly alter the field penetration over a simple idealized picture. Using a laser-aided spectroscopy, densities and velocity distributions were obtained for various species at distances down to about 30 µm from the anode surface in an ion diode . 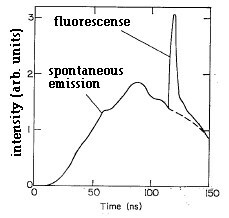 This figure shows the experimental results for spontaneous emission and induced fluorescence of the Mg II 3p 2P3/2 - 3s 2S1/2 transition, with a laser excitation of the inverse 3s 2S1/2 - 3p 2P3/2 transition. Here the laser intensity was 70 kW/cm2, the time was about 120 ns after the start of the high-voltage pulse and the spatial resolution was about 100 µm. The Stark shift measurement technique was later applied to the PBFA-II ion diode at Sandia National Laboratories. 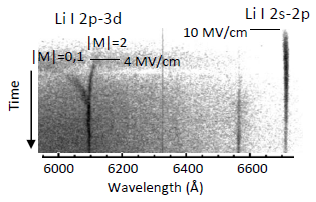 The E-field distribution in the PBFA-II ion diode was measured from the Stark shifting of the Li I 2s-2p transition and found to peak at 1 GV/m near the anode and decrease towards the cathode. 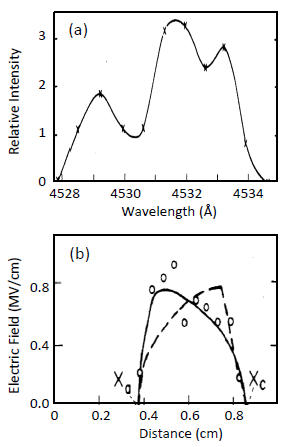 The Stark shift measurements on PBFA-II also provided a unique opportunity to study the basic atomic physics of field ionization. In addition to the Li I 2s-2p transition, the Li I 2p-3d transition was also observed , which has a higher lying upper level that is more affected by the Stark effect. The > 5 MV/cm electric fields shift the 3d level completely into the continuum and the 2p-3d emission is not observed until the field falls below ~4 MV/cm (Fig. 5). When it is observed, the 2p-3d line is split into two components: one corresponding to the |M|=0,1 components of the 3d level and one corresponding to the |M|=2 component. These observations motivated the development and benchmarking of fundamental computations of the field ionization of various levels , and led to the first models of polarizations induced by ion beam excitations .